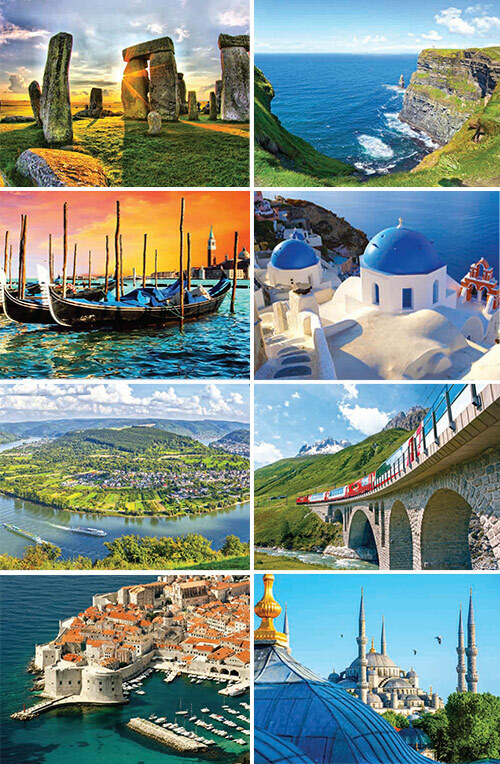 From the glorious view as you dine at the iconic Eiffel Tower, to sharing a laugh with a local character at Ireland’s oldest pub, or sitting down for a home-hosted lunch in Umbria, Collette brings you this inspiring collection of European tours that will change the way you see the world. There's a freedom in guided travel that you won't experience on your own. Knowing that everything will run smoothly, knowing that the hotel will be just right, knowing that all the must-see highlights are included… this is what travelling with Collette is all about. Collette's team carefully designs each itinerary to feature an inclusive blend of must-see sites, immersive experiences, strategically located hotels and culinary events. With Collette, you get more on tour, so you can say you did it all. As a guest of Collette you are treated like a VIP from start to finish. The logistics are seamlessly handled in the background, so all you have to do is enjoy your travel experience. Your expert Tour Manager will be there all the way, sharing insider knowledge and making sure everything runs smoothly. The Collette experiences you’ll find as part of each itinerary are travel moments both large and small. These are the immersive inclusions that allow you to truly come to know a destination and, more importantly, the people who call that place home. Every destination has its iconic locations that are simply a must for visitors. Collette’s inclusive itineraries interweave the “must-see’s” with immersive experiences to create a richer portrait of the destination. Food remains a wonderful window on new cultures. Authentic culinary experiences take you into the destination, inspiring both your understanding and taste buds. Whether it’s the amenities, the fascinating history, the amazing view or the incredible location, your hotel often turns into a highlight all its own. They become more than a place to rest they become a part of your own story. The Collette collection of tours offers an inclusive look at a wealth of amazing destinations. From marvelling at the must-see’s to becoming a part of new cultures to exploring on your own, these itineraries offer an inspiring and easy way to travel. With an average of 18 guests, these personal adventures focus on culinary experiences, cultural immersions and unique accommodation that capture the destination. Enjoy a new perspective on the world. Explore and relax in the world's most remarkable destinations during a single-hotel stay. Immerse yourself in the fanfare of a grand city or unwind in the timeless countryside. Collette river cruises feature small, intimate vessels for travel through a variety of beautiful waterways. Plus, when you step off your ship with a Tour Manager by your side, you’ll truly come to know the people and places along the river. • Private chauffer driven service on air-inclusive reservations. Collette is a third generation, family-owned company with offices in the United States, Canada, Australia and the United Kingdom. Since 1918, Collette has been sharing a love of travel. No matter how you want to see the world, Collette can take you there. Whether you want to travel across an entire country, dive into a local culture, or come to know one of the world’s great cities, Collette has the travel experience that’s right for you.